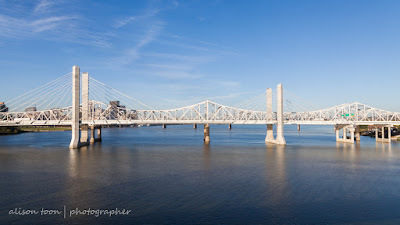 This is the view, looking west and towards downtown Louisville, from the middle of the Big Four Bridge, a pedestrian and cycle bridge that links Louisville, Kentucky, with Jeffersonville, Indiana. The water is calm; the sky, pure blue. I walked across the bridge from the Jeffersonville side this morning, meeting a few friendly walkers, everyone saying hello. Part-way across, chamber music, a string quartet, played through overhead speakers, and I no longer heard the freeway traffic on the two white bridges closer to the city. Taking the opportunity, while in Louisville, to visit the Muhammad Ali Center, I walked into town from the footbridge. Google maps kindly advised me to walk on the freeway that runs parallel to the river; instead, I chose to go past the Louisville Slugger field and turn right on Main Street. The city is surprisingly quiet for an American city; it feels like Boston but warmer and without all the people or crazy drivers; Seattle but without mountains and with bourbon instead of coffee; quiet, friendly and sunny, and with a whole row of mid-renovation buildings that are, right now, just five or so storeys of brick facade, like a movie set. They will look beautiful when finished. Everywhere in the town are reminders of Louisville's history, the good and the bad. 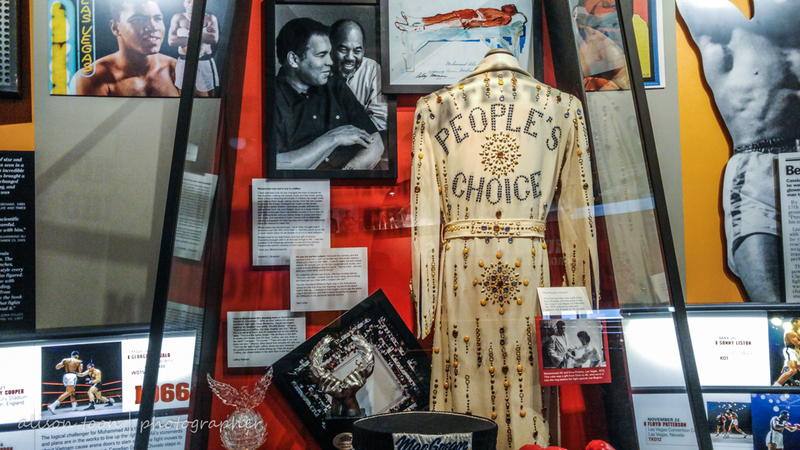 If you go to the Muhammad Ali Center, you'll find not only the story of the boxer, but a lot of civil and human rights and spirituality too. While I grew up watching Cassius Clay and then Muhammad Ali fight--and win--and thought I knew all about his time in prison and his conversion to Islam, I really had no clue. If you have a couple of hours to spare while in Louisville, do go and visit the centre. Please. snapshot are copyright of the center. I walked back to my hotel in Jeffersonville across the Clark Memorial Bridge, which carries both non-freeway traffic and a few (brave or stupid?) pedestrians each side, on narrow sidewalks. (There's an unnerving bit at the end, where a vehicle had run off the road, across the sidewalk, and bent all the railings so that right now, there's a human-size gap which I really didn't want to dizzily fall into.) 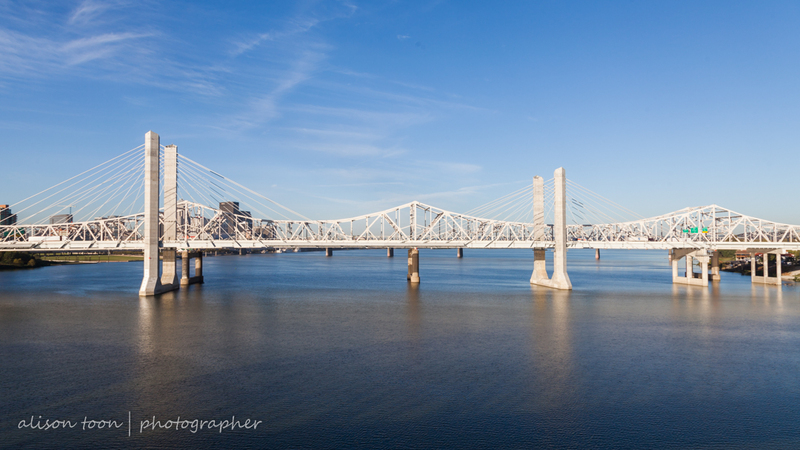 It wasn't at all quiet on that bridge, but the Ohio River still looked calm. Placid. However... just a little way further out of Louisville past the Big Four Bridge tomorrow? It's Louder Than Life! And you can guarantee one thing: it will NOT be quiet, or calm, or tranquil, or placid, not one bit. I don't know what I'm more excited about... seeing my fellow Brit Ozzy Osbourne for the very first time (yes, seriously the very first time, despite having horrified my parents with Black Sabbath for several years when I was a kid); seeing many of my favourite bands again and discovering new favourites (it happens every time); to hearing each and every one of the bands in the line up; or having fun with all the fans who will be there from all over the USA and further! It's going to be a loud and fun weekend! And if you are still procrastinating and know that you'll kick yourself if you miss it? Go here and see if you can still get a ticket. Go on... I'll see you there!!! It'll be a knockout. Muhammed Ali, Louisville Slugger style!